Northants Steelbacks skipper Alex Wakely can’t wait to thank the club’s fans for their ‘overwhelming’ support when he and his team-mates take part in Saturday’s open top bus parade (start 11.45am). The NatWest T20 Blast champions will show off their trophy in the lunchtime parade, with the team travelling from the County Ground into town and finishing up at the Guildhall, where they will be treated to a civic reception by the Borough Council. The team are celebrating their superb T20 Blast victory, with Wakely’s men turning on the style on finals day at Edgbaston last month to beat Notts Outlaws in the semi-final and Durham Jets in the final. 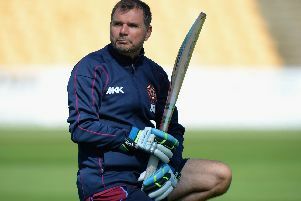 Prior to finals day, the Steelbacks performed brilliantly to 5,000-plus crowds in the group stages and also quarter-final, and Wakely said: “The support we have had has been overwhelming to say the least. “I love this club and town so much, and it means the absolute world that we have been given the chance to show off our trophy at the parade on Saturday. The Steelbacks are the second team to be treated to a parade and civic reception in a matter of months, with the Cobblers also showing off the Sky Bet League Two trophy on the forst weekend of May. NBC leader Mary Markham said: “This has been a fantastic year for Northampton’s sporting teams, and Northamptonshire Steelbacks’ recent Natwest T20 Blast victory is a great way to finish the summer. The parade completes a week of celebrations for the players, who also enjoyed laps of honour at the Saints and Cobblers fixtures last weekend, at Franklin’s Gardens and Sixfields respectively.